Last December, Amazon Chief Executive Jeff Bezos revealed that the third-generation Kindle had become the best-selling product in the company's history. However, Amazon declined to disclose actual sales figures. "We're seeing that many of the people who are buying Kindles also own an LCD tablet," Amazon Chief Executive Jeff Bezos said. "Customers report using their LCD tablets for games, movies, and web browsing and their Kindles for reading sessions." Despite the fact that the Kindle had a several year head start on Apple's iPad, the successful launch of a feature-rich tablet by Apple has forced Amazon to compete on price. Last year, rather than add features and more robust media capabilities, Amazon stuck with the low-cost e-ink display and slashed the prices for its third-generation Kindle. However, Amazon may now be looking to cultivate a healthy app ecosystem for the Kindle platform. Last month, AppleInsider reported that prominent developers for iOS were being contacted by Amazon inviting them to port their apps to Kindle. 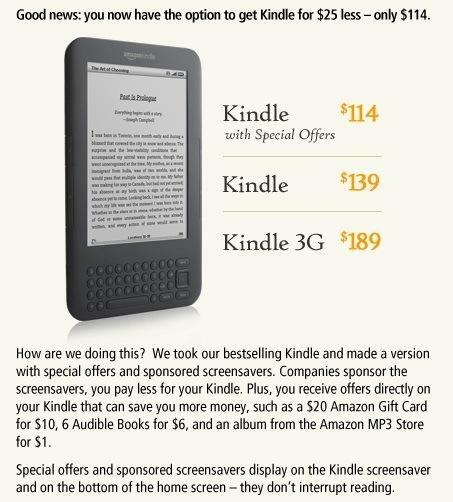 Responding to the news of an ad-based Kindle, pundits expressed surprise at the $114 price tag, noting that a $99 price tag would have made more sense. As such, speculation has arisen that Amazon's margins on the Kindle have bottomed out, with some suggesting that the online retailer may be selling the e-reader at a loss. In contrast, rival Barnes & Noble took the opposite approach last year when it moved away from e-ink and introduced the Nook Color, an Android-powered 7-inch tablet and e-reader hybrid with an LCD screen. In addition to being significantly cheaper than an LCD screen, e-ink comes with its own advantages. Since it does not require a backlight to operate, readers experience less eye strain and can read more easily in direct sunlight. Apple has shown interest in e-ink technology, as evidenced by a patent application discovered by AppleInsider last week. The filing described a hybrid e-ink-LCD display that could switch between the two types of screens as needed.